While it’s no surprise the majority of marriage proposals occur around the Christmas holidays and then on Valentine’s Day, running a close third are spring and summertime proposals. There is just something super romantic about summer vacation getaways! Like many other long-held traditions, engagement etiquette has changed drastically over the years. Many couples now become engaged on a date with special meaning. For example: the anniversary of their first date, when they first met or perhaps the day they moved in together. From a favorite restaurant to your “special” spot at the beach or in front of friends and family, generally one partner makes all the arrangements and often this includes selecting the engagement ring. Hopefully, if you’re responsible for choosing the ring, your partner has given plenty of hints on exactly what she wants. Or maybe you got smart and reached out to several of her closest friends for some suggestions. Yes, many girls do sit around gabbing about what their dream engagement ring would look like! Of course, the number one all-around super-duper best idea is to ask me to design her own custom created engagement ring! ;) But if you already know exactly which ring she has her heart set on, then at least follow these helpful suggestions to make sure the proposal goes off without a hitch. No one wants to be given the perfect engagement ring only to discover it doesn’t fit. There are several different ways you can determine her correct ring size without spoiling the surprise. Trace the inside circumference of a ring she wears frequently. No paper or pencil? Slip the ring on your finger, grab a Sharpie and mark how far down the ring slides. Or if you can get away with it, borrow one of her rings and take it with you, that way you know you’ll have the right size. If necessary, err on the side of the ring being too large…nothing is worse than not being able to slip that gorgeous band over her knuckle. None of these sly tricks are perfectly fool proof, but they will help you get in the ballpark. Find out what type of stone she would prefer. Gone are the days when nothing but a diamond would do. Now as long as it makes her happy, any stone is permissible. Just remember, no matter what gemstone you decide on, do your homework. Softer stones are not ideal for a ring that she will wear everyday for the rest of her life! Moissanite, ruby or sapphire are durable gemstones that are good alternatives to a diamond engagement ring. There are also antique, fair-trade and lab-grown diamonds and gemstones to consider as well. You love your fiancée and want her to say yes, but please don’t break the bank when it comes to selecting her engagement ring. The old adage of a ring costing at least three month’s salary no longer applies. And considering finances are one of the top ten reasons why couples divorce, why start your life together already in debt? Of course the simplest way to avoid these problems is by presenting her with a hand-crafted engagement ring by Danielle Miller Jewelry. 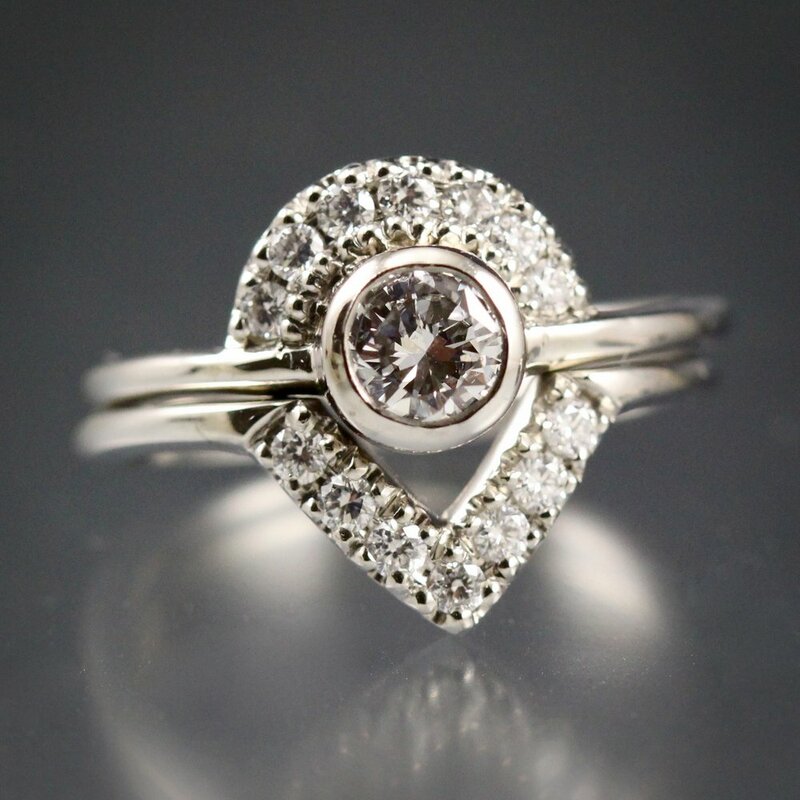 Whether it is one of my most popular engagement ring designs or if it's completely custom designed especially for her, the ring will be created to your specifications including stone and metal preference. I’ll always work within your budget to make sure you are completely satisfied. Then after you pop the question and she says yes, why not make your upcoming nuptials even more special by making your own wedding bands? I offer wedding band workshops throughout the year and only schedule one couple per workshop, ensuring complete personalized attention. This is the ultimate romantic gesture, complete with a story which will entertain your kids and grandkids for years to come.